Or research is conducted primarily in the Northeast Coastal and Barrier Network (NCBN) within the National Park Service (NPS) and US Fish and Wildlife Service (USFWS) National Wildlife Refuges (NWR). Our team has been working to monitor the coninually changing coastal topography within the parks and refuges we are examining. We have developed a three part protocol that incorporates shoreline position, beach-dune cross sectional area, and subareal volume to quantify topographical change and describe geomorphological evolution. Our efforts are aimed at providing park and refuge administrators with information based in physical science to develop informed natural resource management decisions. The shoreline position - defined as the neap tide high tide swash line - is collected every spring and fall for each of the park or refuge units we are monitoring. We use a Trimble GeoXT GPS unit with differential correction to collect a position for the shoreline every 5 m alongshore. We derive temporal metrics of displacement from the collected shorelines to create annual and 5-year trend reports. Cross section profiles are collected every spring and fall as a part of our 2-D data collection. We have set up networks of transect lines across the parks and refuges designed to capture indicators of both cross-shore and alongshore sediment transport. Using high accuracy GPS survey equipment, we collect high resolution topographical data along each profile line and make geotemporal comparisons between our bi-annual surveys. For areas of the park that warrant closer observation, we collect 3-D data that allows us to calculate sediment budget volumetrically. The data is collected quarterly along high density networks of cross-shore transects. Digital elevation models are built from this data and compared temporally. By analyzing the spatial distribution of deposition and erosion derived from our 3-D data, inferences can be made about interactions of physical processes, human influence, and topography. Psuty, N.P., and T.M. Silveira, 2011. 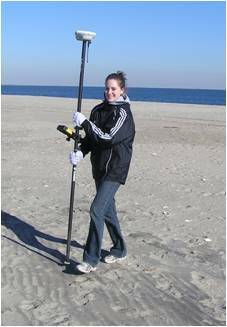 Monitoring Shoreline Change Along Assateague Barrier Island: The First Trend Report. Journal of Coastal Research, Special Issue 64. Psuty, N.P. and T.M. Silveira, 2011. Tracking Coastal Geomorphological Change: An Application of Protocols to Collect Geotemporal Data Sets at the National Level in the US. Journal of Coastal Research, Special Issue 64. Psuty, N. P. and Silveira, T. M., 2009. 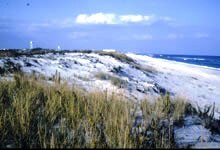 Trend in foredune crestline displacement, Fire Island National Seashore, New York, USA, 1976-2005. Journal of Coastal Research, SI 56 (Proceedings of the 10th International Coastal Symposium), 15 – 19. Lisbon, Portugal, ISSN 0749-0258.